Apple’s latest video product suite gives you the power to edit video like never before, and Final Cut Pro X has everything you need to edit, organize, and delivery your video projects like a pro. In this three part learning series, you can learn the ins and outs of maximizing Final Cut Pro X – from importing media and getting started to adding effects, transitions, and finishing touches – with Final Cut Pro X. 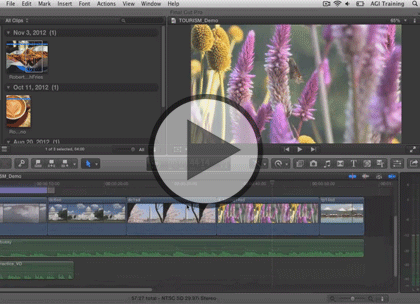 Create events, import media, rate and select clips, and get a handle on editing basics. Gain professional expertise on working with audio and video and adding effects to your projects. Easily customize audio and video with this step-by-step tutorial on correcting color, transitioning between clips, and applying titles. This course assumes very little familiarity with Adobe Final Cut Pro. This course is part of 3 courses, Final Cut Pro X: Workspace, Keywords & Importing, Final Cut Pro X: Video/Audio Edits, & Timeline, and Final Cut Pro X: Color, Transition & Exporting. Please be sure to view the courses in order if you are new to the material.